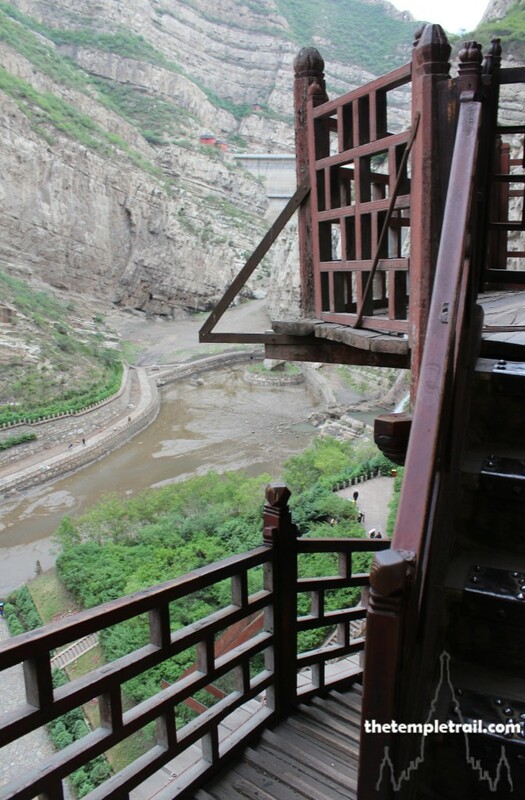 Your stay in the coal town of Datong has been brief. After a day exploring the old hutongs, reconstructed temples and city walls, you make the break and hire a driver to take you out of the perma-grey atmosphere. The driver cheerfully chatters to you in a mix of English and Mandarin, hoping to hone his language skills. As you circle the newly constructed old city walls on the ring road that circumnavigates them, you veer off and take your straight shot out over the bridge and then southeast. The scenery begins to change and, despite the sky remaining steely, starts to take on a more pastoral nature. Passing fields, you see clusters of family tombs amid the crops. These have been placed in accordance with the geomancer’s fēng shuǐ (風水) readings from his compass (羅盤 luópăn). As the crops seem to be fighting against all odds with the air quality, perhaps the placement of the bones is working. Soon, the landscape becomes rockier and more mountainous. 65 kilometres from Datong you begin to make out the features of Mount Heng (恆山 Héng Shān), one of the Five Great Mountains (五嶽 Wǔyuè) of China. Known as the North Pillar of Heaven, the local folklore says the mountain was made one of the five by the legendary emperor Shùn (舜). Mythology aside, the mountain has been holy since the Zhou Dynasty (1046 – 256 BCE). You climb up a road that threads through a pass and into rocky ground at the mountain called Cuiping Peak. Ahead of you, an impossible structure starts to come into focus. 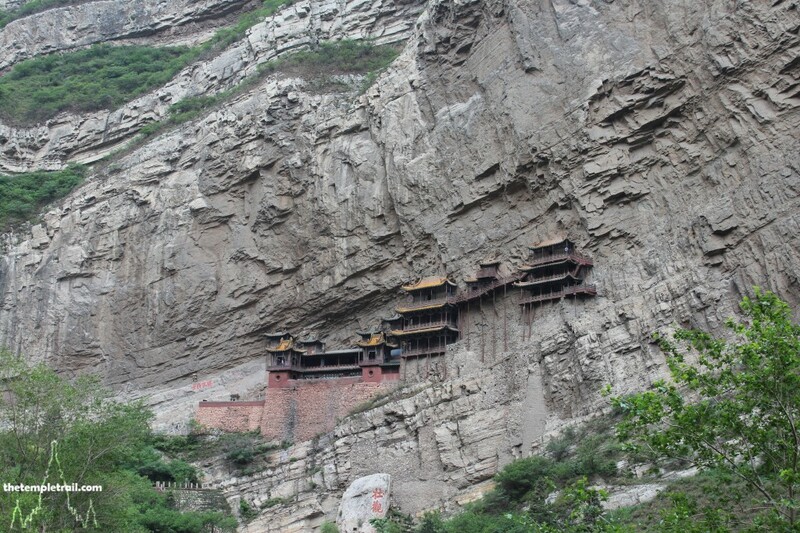 You get out of the car and look across the small valley at Xuánkōng Sì (懸空寺), the Hanging Temple. 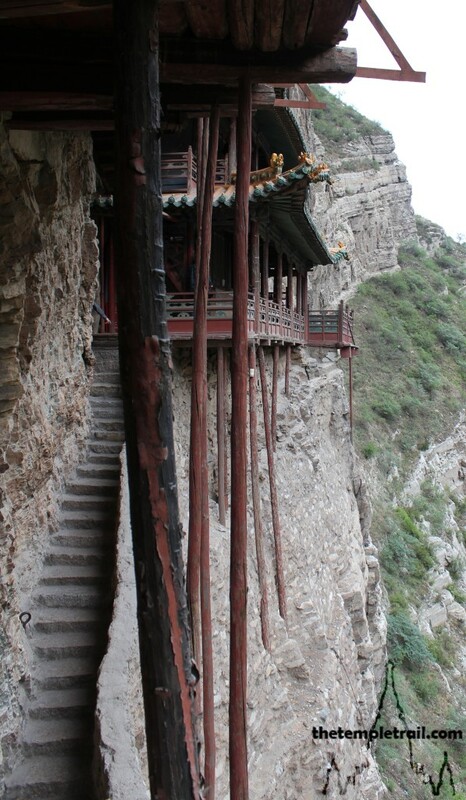 Xuánkōng Sì means “mid-air temple” and is better known to Westerners as the Hanging Temple. 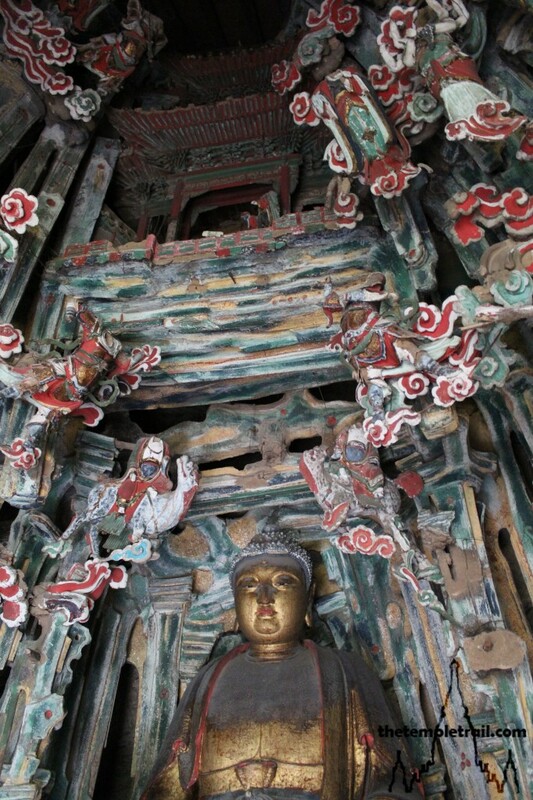 Founded in 491 CE, during the Northern Wei Dynasty (386 – 534 CE), the temple is more than 1,500 years old. Although it has been expanded over the years, it is ancient and magical. 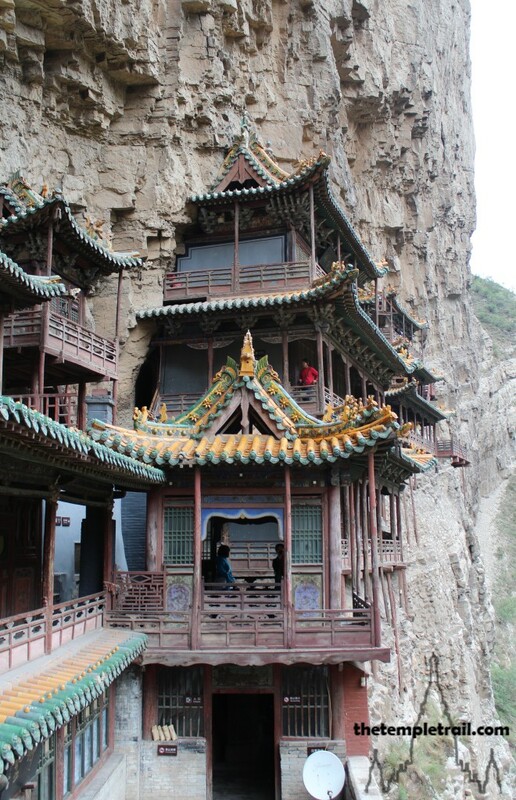 Built 75 metres above the ground into a cliff on Cuiping Peak, it was created by a monk called Liǎo Rán (瞭然). His name means ‘see clearly’ and his vision was for a temple that defied belief. The original temple was said to have been built solely by him. 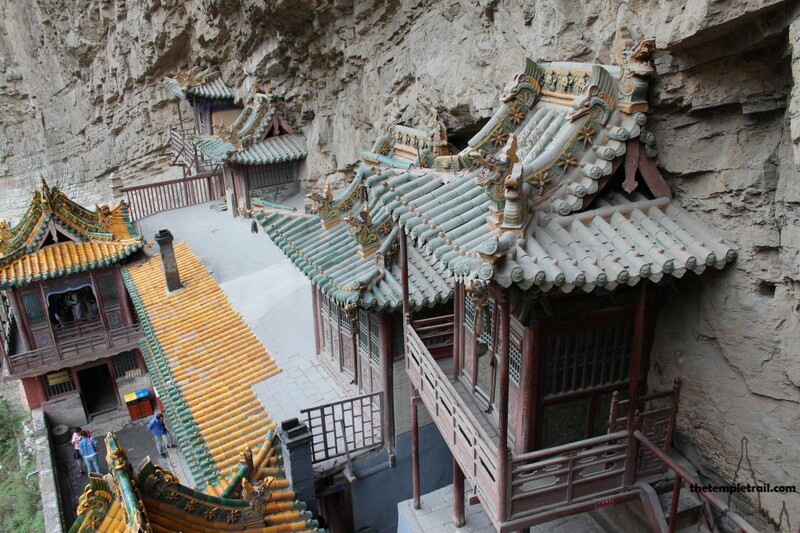 The temple was founded when the centre of Taoism was moved from south of Datong to this area. It was built with the principle that neither the crowing of a rooster or the barking of a dog should be able to break the silence of the temple. 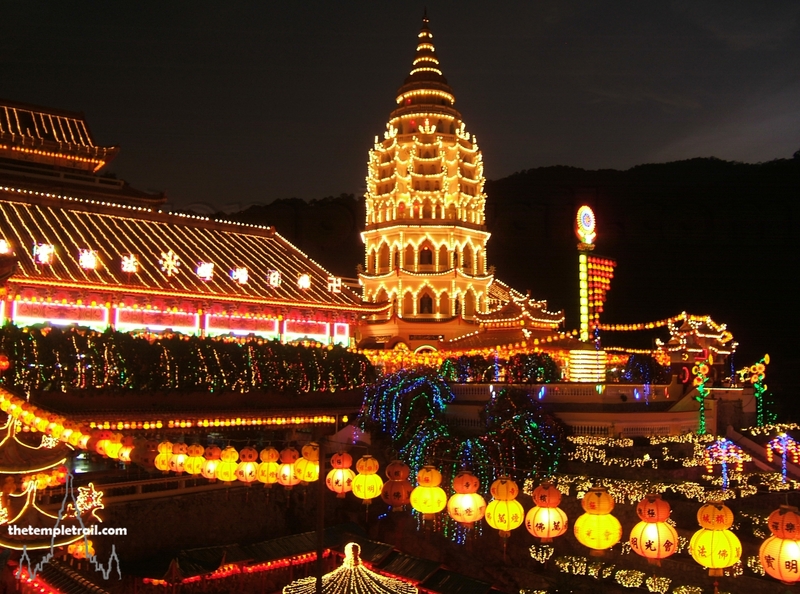 It is the oldest temple that amalgamates the three major religions of China and Buddhism stands side-by-side with Taoism and Confucianism. Over the passage of time, it has had many famous visitors. 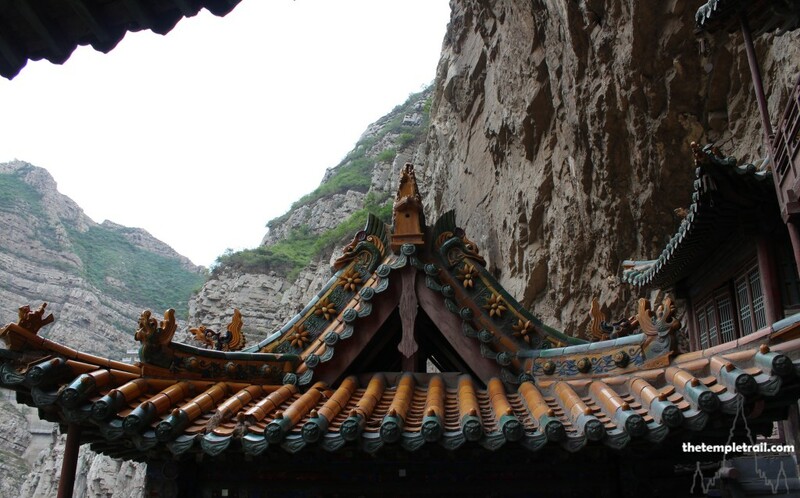 It was seen by Lǐ Bái (李白), the Tang Dynasty (618 – 907 CE) poet who called it ‘spectacular’ and inscribed that into the cliff itself. The ‘miracle under the sun’ was also recorded in the writings of famous Ming Dynasty (1368 – 1644) travel writer Xú Xiákè (徐霞客). 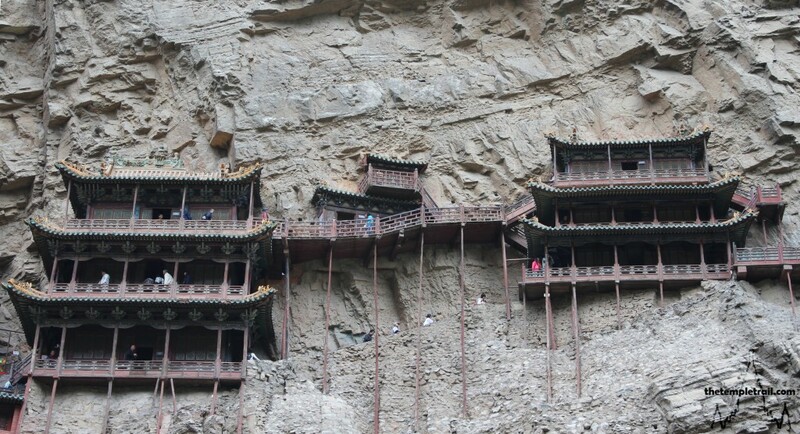 The temple is suspended onto a sheer cliff and consists of more than 40 rooms, each no bigger than 36 square metres. The halls are anchored into the cliff with oak crossbeams that slot into shafts cut into the rock face. Although the buildings have wooden posts that reach down from the bottom of the buildings, these are visual only and do not bear the load. The entire support system is hidden in the cliff. Sheltered under an overhang, the temple has escaped erosion and survived to this day, out of the reach of floods, snows and direct sunlight. Crossing the small canyon on foot, you almost run towards the mysterious gravity defying structures. From the floor of the canyon, they seem surreal. They adhere to the rock in a way that bends your perception. 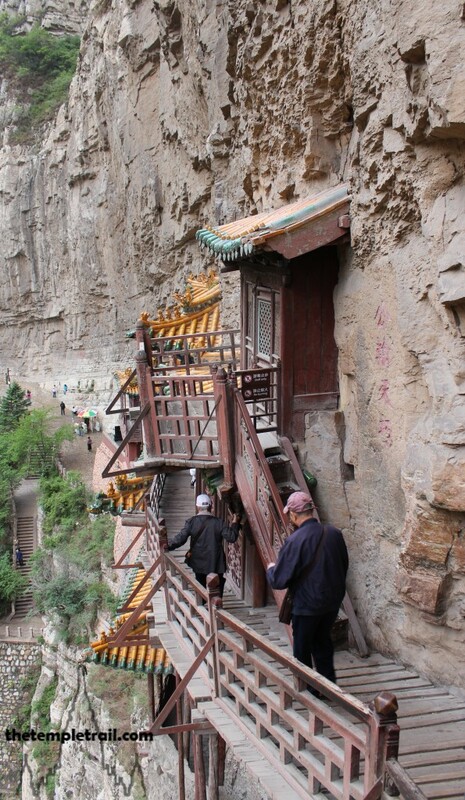 Climbing a twisting walkway, you eventually appear on a stone courtyard before the main entrance to the temple. The red painted brick walls set the first structures off from the grey of the cliff and sky. 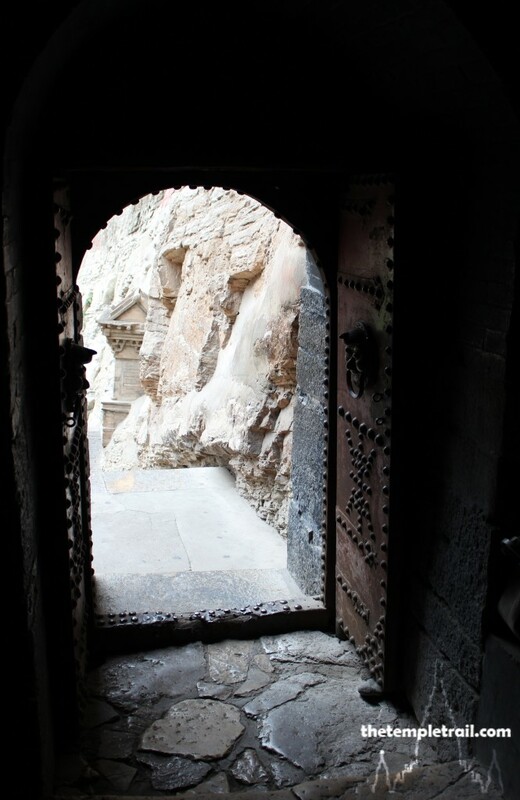 A small doorway, painted black and huddled next to the rock, forebodingly welcomes your entry. 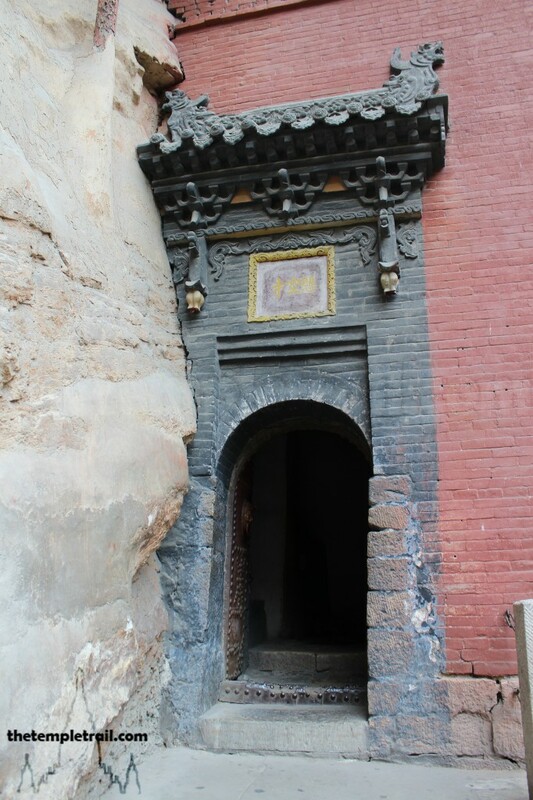 Approaching the portal, you see that the small painted iron door to the temple has a gold-coloured handle in the shape of a ghastly face. 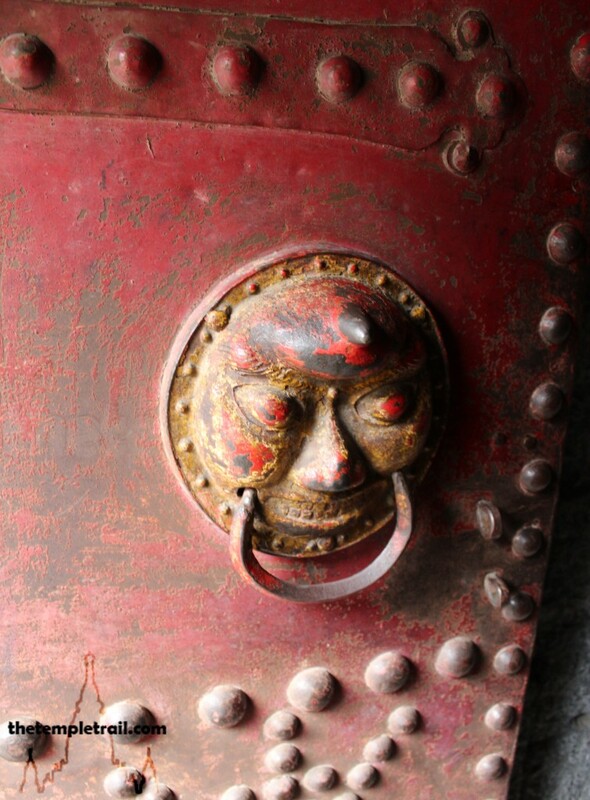 The handle is decorative, but also protects against malignant spirits and serves as a warning to evil doers. Entering the dark foyer, you walk through it into the daylight. You now stand in the largest accessible courtyard of the temple. Inside it, you would not imagine that you are on the side of a cliff, as it is made of brick and stone and sits on a stone ledge. From here on the shelf, you are surrounded by buildings. The lobby you walked through is the base of the first of two towers that flank the courtyard, the bell tower. Behind you, halls climb the cliffside, but walking to the railing, you are afforded a view that reminds you of exactly where you are standing. The courtyard gives you a very strong feeling of stability, but looking at the wooden structures that lie ahead of you, your knees begin to go a little weak. Forging ahead, you dive into the second tower, the drum tower, and up a narrow and rickety wooden staircase to the second floor. 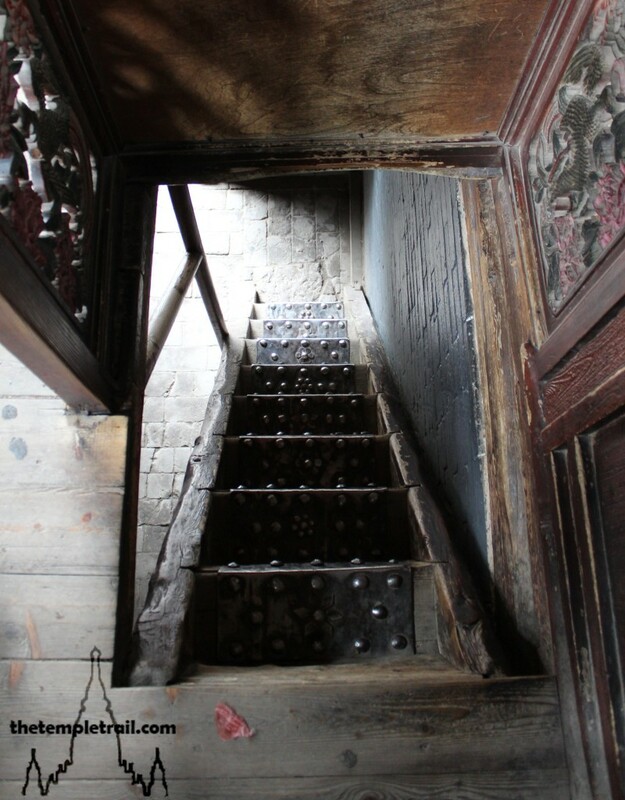 The woodwork is protected with metal and the carving at the top of the staircase is intricate, giving it both an elaborate and utilitarian feel at the same time. The wind blows through the open windows and you are fully aware of the fact that you are inches away from a sheer drop. A small Taoist shrine sits in the corner of room and you feel that the god is there simply to give people someone to pray to before navigating the tight, low-railed verandas of the two wooden hanging stacks. Looking out of the window, you gaze at the wooden piles and the hanging halls. The door leads out to a patio that leaves you staring at a thin wooden walkway. The temple was built in accordance with the Taoist principle of silence and up here, the only sound you can hear is the beating of your own heart. Summoning your courage, you step gingerly onto the wooden slats. Having tested it with your first foot, you bring your second onto the walkway. Each step feels unnatural. To your left is a closed hall building. To your right a sheer drop. All that separates you and thin air is about five centimetres of wood. Here on the first of the two stacks of fully suspended halls, you find yourself wondering how nobody has fallen off. The railing barely comes past your knees. It takes a supreme leap of faith to remain strong in the knowledge that the temple has been here for a millennia and a half and that it is structurally sound. At the end of what feels like one of the longest walks of your life, you get to a set of steps that has been carved into the cliff. You take the stairs and begin to bridge the gap between the two stacks of halls. The stone feels substantial and solid compared with the wood and a confidence comes into your step. As the walkway ascends, you feel as if you are climbing into the heavens themselves. Finally, you are back on wood and walk along the veranda of the first level of the second set of wooden halls. Walking to the end, you don’t feel as concerned as you did on the first stack. You have eased into the idea of walking on air. At the end of the halls is a viewing platform that hangs off the edge of the building. From here, you are given a panoramic view of your surroundings. The small valley looks vast from where you stand. Climbing the stairs to the second floor, you enter the first hall of your circuit. The Hall of Avalokiteśvara is a tight and colourful hall. The years have been kind to the paintwork and the moulded figures cover all of the space available. The Golden statue of Avalokiteśvara (觀世音菩薩 Guānshìyīn Púsà) takes centre stage amid acolytes and guardians. 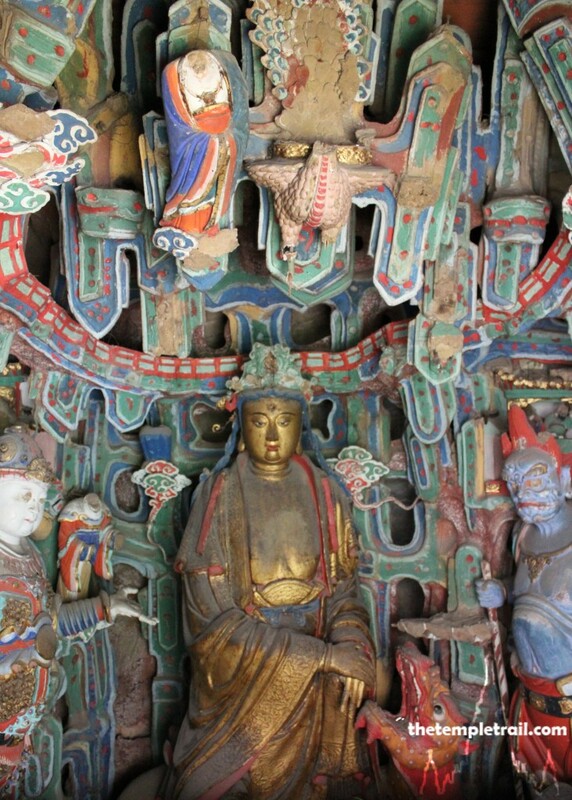 The bodhisattva of mercy is a popular figure in China, particularly in the female incarnation of Guānyīn (觀音), and has his own hall here in this space-limited temple. It is a testament to his popularity that this space is reserved just for him. Leaving the psychedelic room, you walk back out onto the veranda and to the end. This time, a set of stairs juts outward and then back again to go to the third floor. You begin to climb the creaky staircase and as it reaches its furthest point away from the building, you have the feeling through your whole body that nothing is beneath you. You believe that, were the floorboards to give out, your plummet would take you a hundred metres straight down to be dashed on the rocks below. There is, in fact the viewing platform, just one floor below, acting as a safety net of sorts, but this logic is not apparent as you traverse the narrow ancient steps. Turning around, you continue upward to the third level. At the top of the staircase, your sense of jitteriness does not desert you entirely. This is the highest point of the temple complex. Counteracting the spinning in your head, you plunge into the hall that occupies this floor. The hall here is called the Three Religions Hall (三教殿 Sān Jiào Diàn) and is probably the most representative of the Hanging Temple. Inside the hall, Buddha, Confucius (孔子 Kǒng Zǐ) and Laozi (老子 Lǎozǐ) are enshrined. These three figure heads of the three main religions show the interaction between them in China. The Chinese may commonly subscribe to one or the other of these faiths (or a multitude of any others), but many will identify with elements of all of them. They are seen as symbiotically existing and not detracting from each other. While this may not be the case ideologically, people feel it is and that’s all that matters. It can oftentimes be difficult for people to know which traditions come from which branch of the three religions. Looking into the faces of the three sages, you see how the Chinese can identify with all three wise men. Each of them brought good teachings into the world and all of the teachings have elements that the Chinese can hold onto as their own. Leaving the hall, nerves steadied by your time in the tranquil hall, you edge along the ledge, down a staircase and onto a wooden walkway that acts a bridge back to the first stack of halls. The sloping surface is wider than in other places, but its angle does not make for comfortable striding. Slowly inching along it, you delve briefly into a cave system that presents itself to your right. The darkness takes a while to adjust to, but in a few moments, you are squeezing through a narrow passage. At the end, you are at the other side of the wooden bridge. Retracing your steps, you go back to the beginning. The cave is safe and secure, but in order to have the full experience, you decide to go back outside. Back on the walkway, you pass a small cabinet that is up a set of steps and closed to the public. You take a few minutes to imagine spending a night in the cell-like room. The balcony hangs low and looks as if it could drop at any moment. The yellow tiles of the roof look a little dustier than the ones that gleam in other places in the temple. Perhaps even the bravado of the temple-keepers gives out when it comes to climbing to the small chamber. Passing under the balcony, you pass a shallow hall mid-way along the walkway. It holds two Buddhas in relief. The worn images are surrounded with painted mandalas and have wide eyed faces. Flecks of pigment hold tenaciously to the plaster, despite being exposed to the elements. Taking a moment to look into the earnest eyes of the Buddhas, you then turn your attention to the view they have. Your heart is calm and the serenity of the temple strikes you profoundly. The monks that were stationed here had deep isolation. The quiet of their minds only disturbed by the force of nature and the cold wind whipping through the timber halls. The stark rocky environment is utterly conducive to meditation and contemplation. You suddenly hanker for solitude and after a few brief moments, you wake from your reflective vigil and continue to the end of the bridge. Standing now on the third floor of the stack, you enter the hall at this level. The Hall of the Three Sages (三聖殿 Sānshèng Diàn) houses the Pure Land Buddhist trinity of Amitābha (阿彌陀佛 Ēmítuófó), Avalokiteśvara and Mahāsthāmaprāpta (大勢至菩薩 Dàshìzhì Púsà). As you step into the hall, you see Amitābha in the centre. He is the Buddha of the Western Pure Land and is very popular in China. The two bodhisattvas stand either side of him. Mahāsthāmaprāpta, much like Avalokiteśvara, is often portrayed in female form in China. Both of the bodhisattvas here are androgynous and despite being male, have no distinctively masculine features. Amitābha, the Buddha of the Western Heaven, is the most important figure in Pure Land Buddhism. Those who pray to him can be reborn in his western paradise. Housed in his brightly hued shrine, the statue gazes out offering good rebirth to all who hold him dear. Back out on the balcony, you go to the staircase and descend to the second floor. The hall of this floor is Taoist and stepping through the wooden door frame, you are flanked by furious looking figures. Ahead of you, three austere beings preside on their thrones. This hall is the Hall of the Three Great Emperor-Officials (三官殿 Sānguān Diàn). The Sān Guān Dà Dì (三官大帝) are the Three Great Primordial Rulers of Taoist myth. The three are the Controllers of Heaven, Earth and the Waters who were sent down to earth by the Jade Emperor to observe the thoughts and deeds of mortals. Tiān Guān (天官), the Ruler of Heaven, is second only to the Jade Emperor (玉皇 Yù Huáng) and he gives happiness, freedom and prosperity. Dì Guān (地官), the Ruler of the Earth, judges sins and grants forgiveness to those who repent and mend their ways. Shuǐ Guān (水官), the Ruler of the Waters, is the controller of floods and dispeller of diseases and evil. He grants freedom from sickness, unfortunate destiny and adversity. After a few moments in their hall, you feel blessed enough to continue to more stable ground. 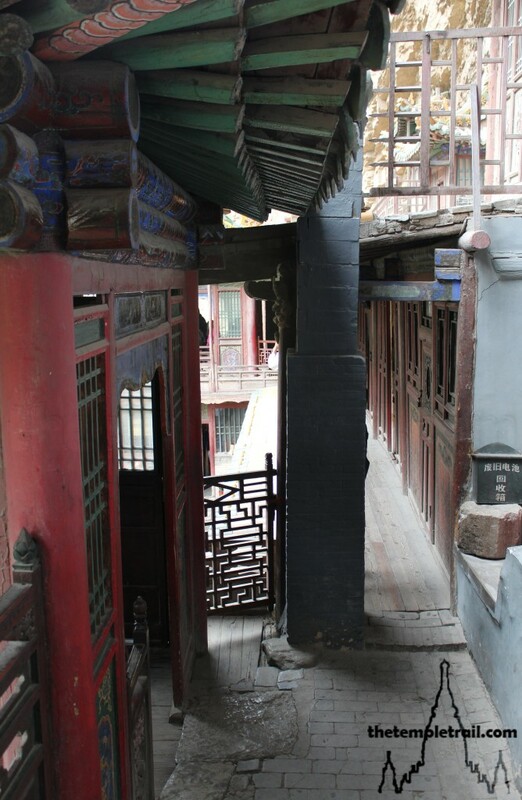 You go down a set of stairs and into the drum tower overlooking the courtyard. Instead of going down the stairs to the open area, you go out to the hall at the back of the court. The hall is Taoist and behind glass more figures loom out at you. This hall is different from the others in that it is very naturally and brightly lit from the large windows. It is wide and has more space than in other parts of the temple. Feeling as though you are in a conservatory, you head out and look over the courtyard. Along the veranda you end up at the top of the bell tower and you take your last glance of the scenery from the temple before climbing down the stairs to the ground level. You notice a bronze statue of Bùdài (布袋), the sackcloth monk. Often called Mílèfó (彌勒佛) in reference to his association with Maitreya (彌勒菩薩 Mílè Púsà), the future Buddha, his happy, fat face bids you farewell as you leave through the dark chamber and out into the light of day beyond the temple gate. You continually glance back at the temple as you make your way back across the canyon to find your driver. From the floor of the small valley, the temple looks even more impossible. The feeling of having gone through a trial courses through your body. You feel exhausted, as though all the adrenalin in your body has been expended. Although you were safe throughout your exploration, you can’t help but think that you took your life in your own hands. Scrutinising the buildings from down here, they look like a nest built by a fantastical bird. Despite your misgivings, you put your faith in the work of the ancient builders. Perhaps the gods and sages contained within have held the buildings fast through centuries of wear and even the occasional earthquake. Re-joining your driver, who you find sleeping in the car, you begin back to Datong. While your mind replays the events of the past hour or so, your body begs for some sustenance. You soon begin to think of the famous shaomai (燒賣) dumplings served at the Fenglinge Teahouse (鳳臨閣) in the heart of old Datong.